There are events planned in Bangkok, Phuket, and Chiang Mai this year. Feel free to add any other events you know of. The American Chamber of Commerce in Thailand (AMCHAM) is having a picnic at KIS International School on Saturday, July 6th from 12.00 noon - 8.00 pm. There will be lots of American food and drink, music and activities, and a chili-cook-off. Tickets baht 200 (advance) or baht 300 (door). Children under 12 free. The Phuket US Navy League (Southern Seaboard Council) is putting on what will likely be the largest Independence Day celebration ever seen in South East Asia. 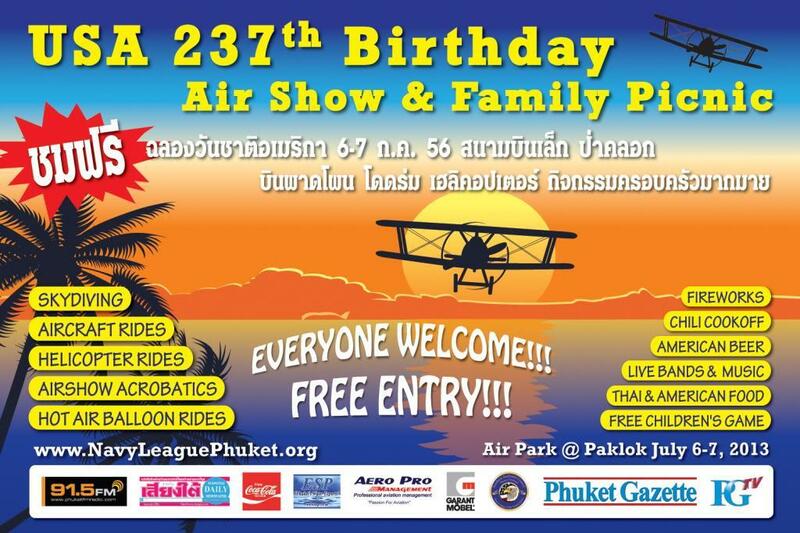 A 2 day picnic and airshow July 6th & 7th 10:00 AM - 20:00 PM at the Phuket Airpark at Paklok. Games, fireworks, music & fun for the entire family. A real American-Style Picnic with American Food & American Beer. Admission is free. Here's Some of What's Being Scheduled...Airshow Acrobatics, Aircraft on Display, Aircraft Rides, Airplane Flying Contest for Kids, Hot Air Balloon Rides, American Food & American Beer, American Product Displays & Sales, Children's Playground/Area, Chili Cookoff, Drag Races, Plane vs Cars, Facepainting, Fireworks, Game Booths, FREE Children's Games, Helicopter Rides & Demos, Hot Rods & Cool Cars, Live Band Music, Magic Shows, Photos with Uncle Sam, Police Helo Commando Demonstration, Skydiving, Thai & International Foods, Thai Navy Helicopters Demonstrations, VIP Lounge, VIP Parking, and much, much, more. 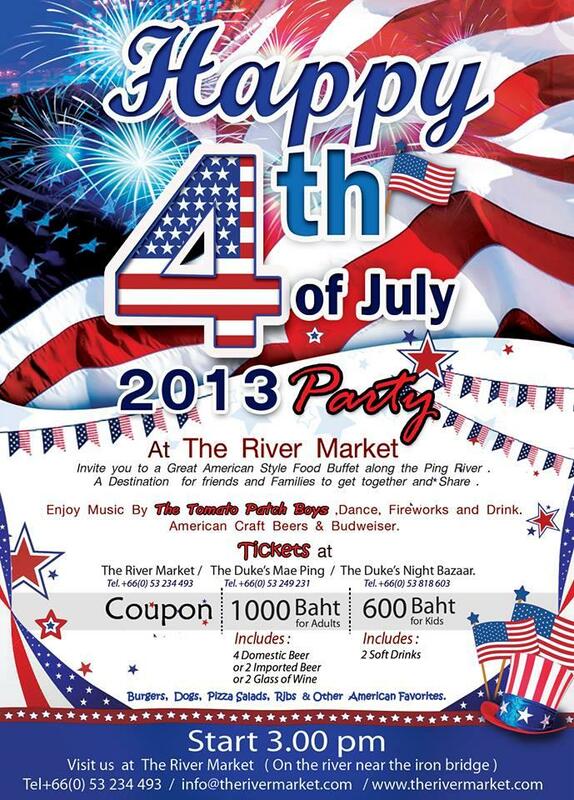 There is a 4th of July picnic with American style food buffet and fireworks at The River Market. Entry 1000B for adults, 600B children. What does the American 4th of July celebration have any bearing in Thai society? Good reason to party ... BBQ ... Fireworks display. Don't think it really matters much to the Thai the reason behind it. Probable about as much as Christmas, St. Patrick's Day, Anzec Day does. Plus any other western holidays celebrated by expats here in Thailand. Or i it just a Yank basshing? Bearing? Not really. Although King Rama IV did offer to send the US elephants during the US/GB revolutionary war. This announcement is primarily for the expat community, may of whom are from the states, but all are welcome. The Phuket event is a combination airshow/4th of July celebration. I will be drag racing a stunt plane on my Ninja at the Phuket event. On the 4th of July I will spend the day sweeping at the local wat to benefit Thai society. You will find it was Lincoln he offered elephants to. Ah ok, I think I see what you guys are on about now. The US Navy League, local Rotary and Lions clubs are putting on this event. Each of those groups do many charitable things in their respective communities. And all proceeds from the Phuket event are going to charity. Visit the links above for more info. We're both wrong, but I was wronger. I was thinking it was the revolutionary war. It was the civil war, but not Lincoln. "Contrary to popular belief, King Mongkut did not offer a herd of war elephants to the US president Abraham Lincoln during the American Civil War for use against the Confederacy. He did, however, offer to send some domesticated elephants to US president James Buchanan, to use as beasts of burden and means of transportation. The royal letter of 14 February 1861, which was written even before the Civil War started, took some time to arrive in Washington DC, and by the time it reached its destination, President Buchanan was not in office any longer. (Text of the royal letter here.) Lincoln, who succeeded Buchanan, is said to have been asked what the elephants could be used for, and in reply he said that he did not know, unless "they were used to stamp out the rebellion." However, in his replying letter dated 3 February 1862  Lincoln did not mention anything about the Civil War. The President merely politely declined to accept King Mongkut's proposal, explaining to the King that the American climate might not be suitable for elephants and that American steam engines could also be used as beasts of burden and means of transportation." I will be drag racing a stunt plane on my Ninja at the Phuket event. Which day will you be there? Seems like the Phuket event is going to have lots of things going on so I might toddle over for a look-see, I haven't been to the air park yet. A day drinking beer and reminding all and sundry that the DoI was written by Brits should be fun! I'll see if I can get Mr Earl to come along with me, he's always good for an argument or three! People from Europe aren't the only ones here. Stupid comment. How many Thai's read the TD? DUH!! Anything for a chance to tale a cheap shot at the stuffy British . I can pretend to be patriotic for a day. Even better, they can't shoot back, they're not allowed to have guns. So that's where Dumbo came from!! Sounds like fun and for a good cause. The 4th is a blast in more ways than one. Post a clip of the race for those who cannot attend if you can. Be safe and good luck Nomadjoe. Thank You for the invitation, I will be unable to attend due to a prior commitment at the American Ambassadors residence to celebrate The 4th. My dad drove an Ambassador. Not the dignitary but the wagon. I recall a trip to Yellow Stone as a child. He was a supervisor at the American Motors Corp in the 70's.The car was a perk or incentive back then. He also had an 1970 AMX with the 390 four speed. And a 1926 model T ford that had the fold up jump seat converted to a pickup truck. On July 4th 1976 I sat in back throwing out candy as we drove in the fourth of July parade in my home town. It was the 200 year celebration of the U.S.A.The best 4th of July celebration I can remember. Thanks for the memory.Remember, when you're out of Budd,tough Shlitz. Last edited by fishlocker; 16-06-2013 at 01:19 PM. Sorry,Schlitz is the correct spelling. Talking of Schlitz.... What's beers are going to be served? Lord Abbot Ale or something thicker. What ever wets you're whistle. Your dad must have been rich, I was a Rambler Rebel baby, came from New Jersey to California in a 67 Rebel. It was kind of sad when AMC folded. The first time I ever drove a car, at about age 10 was driving that station wagon around a huge church parking lot. They had Sam Adams last year. And there was a good selection at Beervana. I'm sure they will put on a good selection again this year. Oi...FP.... I was asking about the Phuket version.... Sam Adams... that would be so good.... Anyone really know about the beer options at the Phuket event? We were average middle class. Back then manufacturing was all the rage here. You could pick where you wanted to work. He said when he got out of the army he had a choice of witch company he wanted to work for.He went to work for AMC. At the moment two are confirmed. MGD and another Miller, either Lite or High Life, I don't recall, and Dos Equis. Of course Dos Equis is actually Mexican, but popular in the states. Maybe more will be added. There will be at least one local beer as well. Phuket Lager, Chang, Tiger are the names I heard at the last meeting.